Fouteen man Clann na Gael claimed a draw with a late fightback against Ballinlough in sweltering conditions in Rath Cairn on Friday evening. For large periods of this B-League encounter, it appeared that Ballinlough would emerge victorious, but poor finishing let them down, and let Clann na Gael mount an impressive come back late in the match. The ‘Lough started the match without many regulars, and were slow to get going. Jonathan O’ Reilly impressed in his wing half back position early on and picked up two great scores after powerful runs forward from defence. Clann na Gael kept the scoreboard ticking over with some great scores thanks to the pace of their full forward line. Lorcan Gibney in the Ballinlough goal, was twice called into action early on, and on each occasion pulled off deft saves to deny great goal scoring opportunities. 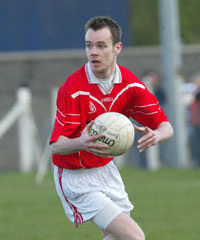 The introduction of Kevin Mallen in the Ballinlough midfield midway through the half helped his side gain the momentum back in the contest. His side’s fortunes also improved after the sending off of Clann na Gaels influential corner forward in the twentieth minute, after he picked up a second yellow card for remonstrating with the referee. The ‘Lough closed out the half strongly with scores from Adam Fox, Ken Rothwell and Jonathan Montgomery Francis, giving them a 0-06 to 0-4 advantage at the change of ends. At times in the second half it looked as though Ballinlough would pull away, but poor shooting prevented them from killing the game off, and they never opened up more than a four point lead. With ten minutes remaining, it looked as though the ‘Lough would pull away, but a series of bad decisions allowed Clann na Gael to get the last three scores of the game to level matters up. Although Ballinlough will be disappointed with the result, they will be happy with the performances of some of their younger players, in particular Lorcan Gibney, Mattie Farrell, Emmett Smith and the Montgomery Francis twins. Ballinlough: L. Gibney, J. Farrelly, J. O’Keefe, M. Farrell, Jonathan O’Reily, E. Smith, P. Monaghan, K. Rothwell, Junior O’Reilly, J. Montgomery Francis, T. Fagan, D. Montgomery Francis, A. Fox, C. Gaughran, D. Farrelly. Subs: K. Mallen for J. Farrelly, T. Shine for Jonathan O’Reilly, K. Devine for K. Rothwell.